The good news when creating an app for your Android is that it is much less of a hassle to get the app loaded onto your local devices than for the Apple device. The bad news is that the setup of the Eclipse development environment is much more involved than the Apple xcode setup. Eclipse, though, can be installed on both Apple and Microsoft systems so that is a definite advantage. 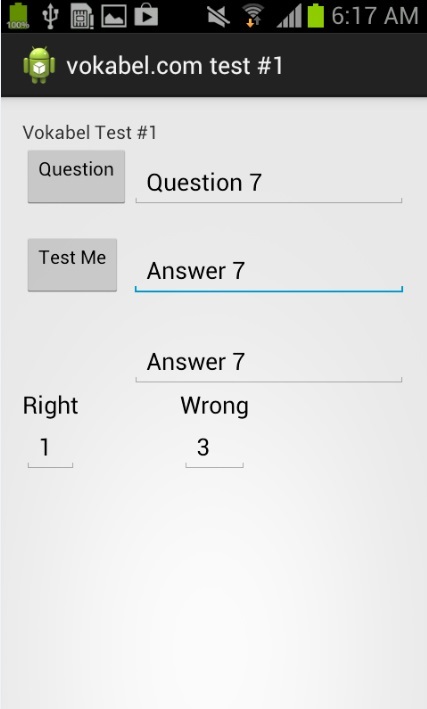 To see how to select one of multiple tests from a list within one app, click here. 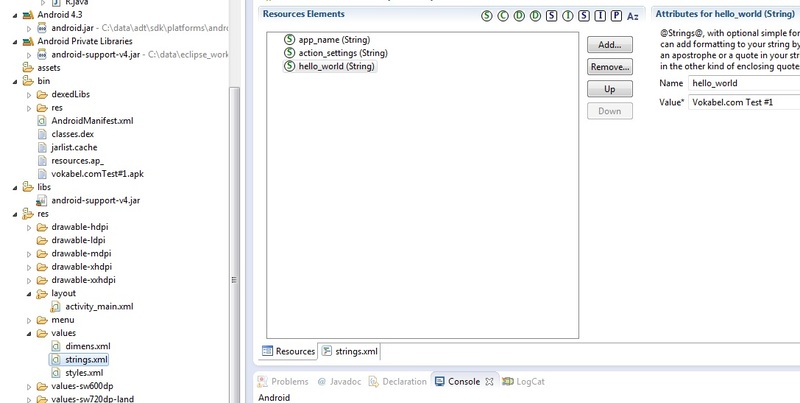 Start by downloading the Eclipse Android development bundle which includes both the Eclipse Java development environment and the Android SDK. Currently, it can be found here. 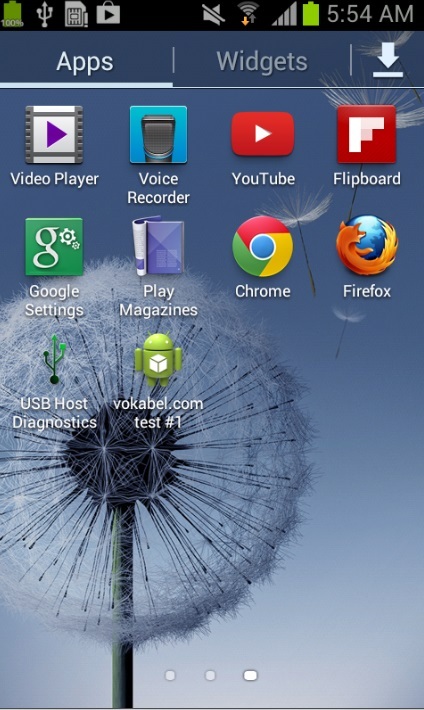 Unzip the files to a directory of choice and create a directory that will be your work directory for android projects. In order to use eclipse you must download and install the Java runtime environment and the Java SDK. Startup Eclipse by going to the Eclipse directory and double clicking the Eclipse executable. Specify the empty android working directory you've created as the workspace. click through by clicking on next to accept all of the defaults for now and then click finish at the last window to complete. You'll notice that Eclipse created some file stubs in the left hand pane. Click on the "Device Definitions" tab and click on the "New Device" button. Get your phone's screen specifications from the Android site by searching on your phone model number. I will be using a GT-S7560M for this tutorial. Next Click on the Android Virtual Devices Tab.Click on New. When creating your virtual device, you may have to do an internet search for the CPU installed in your device model. If you are developing in MS Windows, specify RAM under 768 MB under memory options. Leave SD card blank if you don't have one. Click on OK to create the virtual device. See the next step of this tutorial for information about specifying the target and how you can get your version to appear in the dropdown list. You would have specified the target Android OS as the next lowest version available to the version on your device. Since my device is running 4.0.4, I specified 4.0.3. 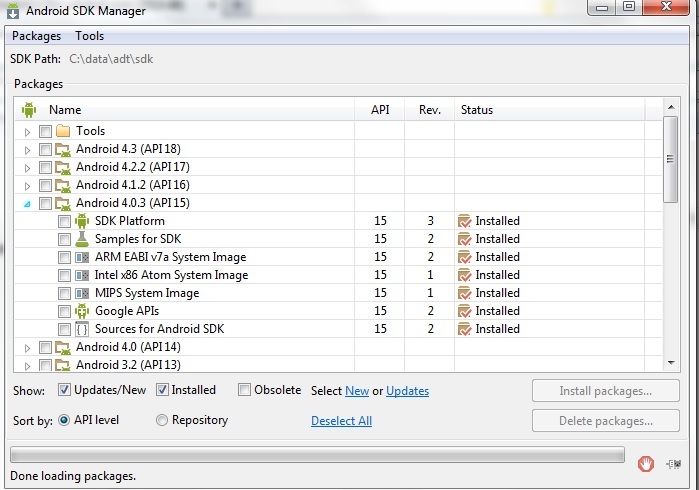 You want to make sure that all of these libraries are available for Eclipse by bringing up the "SDK Manager" application in the root folder of the Eclipse Android Bundle extract (close the Eclipse development environment first). If it is not installed, and there is a good chance it isn't, click in the install checkbox of the version you would like to install and proceed with the installation by clicking on "Install Packages". Record your API number. 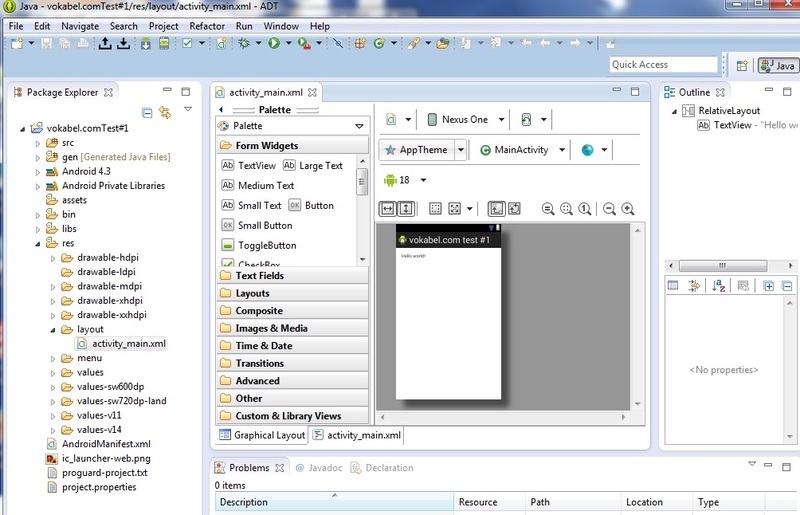 You can also bring up the "SDK Manager" from within the Eclipse development environment by clicking on the "Android SDK Manager" icon in the toolbar. You might have to restart Eclipse to see the target that you just installed in the drop down target list. You should now be ready to start developing your Android Test App. Let's start by running the "Hello World" application which was created when you clicked on "New Application" above to make sure our emulator is set up properly. 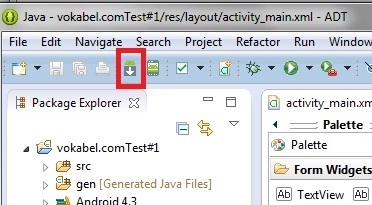 Click on the Run arrow and select run as "Android Application". The first time you run the emulator it will take a few minutes to start up so be patient. 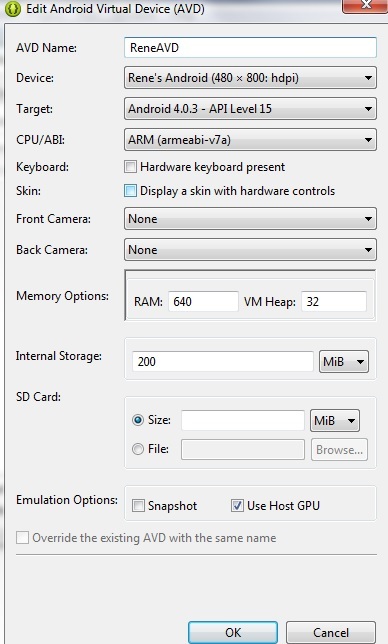 Whenever you want to start the emulator with this app in the future, select the application under the run menu. If you are greeted with a lock screen, click on the lock icon in the emulator with your mouse and drag it to the right. You should then see your application. Let's now build the graphical user interface. We'll add 5 textboxes, 2 pushbuttons, and 5 labels (keeping the original hello world because we don't want to break anything). If the GUI editor isn't displayed, you can bring it up by clicking the "res" folder under your project , clicking on layout and then opening the activity_main.xml file. Click on the Graphical Layout tab to see the GUI builder. Perform the appropriate modifications by clicking on the widget in question and modifying the appropriate property in the properties box. (note, it takes some work gaining familiarity with the properties of the widgets and what happens when you modify them). Let's now look in the code where the Hello World! string is defined and change this to the name of our application. It looks like the developers of the Hello World app referenced it as a string resource in the GUI builder so we have to change the entry in the strings.xml file. "Question 1" "Question 2" "Question 3" "Question 4" "Question 5" "Question 6" "Question 7" "Question 8" "Question 9" "Question 10" "Answer 1" "Answer 2" "Answer 3" "Answer 4" "Answer 5" "Answer 6" "Answer 7" "Answer 8" "Answer 9" "Answer 10"
Right click on res/values and select New, then select Android XML File. Call the file "questions". 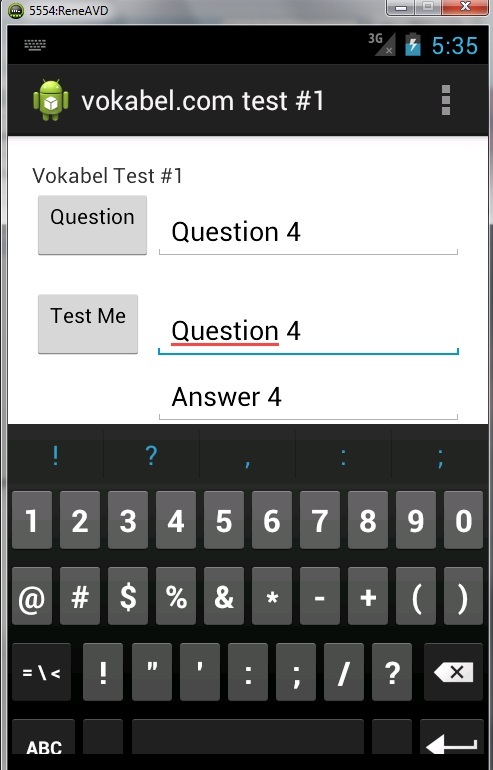 Next right click on the the questions.xml file, open with, and select text editor. Paste the above question/answer arrays into your questions.xml file. In the oncreate method, load the questions array into an array called questions_array and the answers into an array called answers_array. 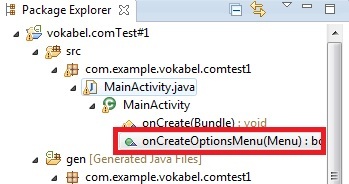 Double click on onCreateOptionsMenu to get to this method. We will be fielding button clicks programmatically by building 2 event handlers (one for each of our buttons) into our onCreate method. Within the 2 handlers we will be programming the logic of what the application should do when the button is clicked. Below is the source code of our main_activity.java file (i.e. our only file with source code in it). Only the onCreate method was modified. Note that we also have to import the appropriate library to deal with certain funtions that we call, but the debugger does a great job of notifying us interactively as we are typing the code what exactly needs to be imported. I've also commented out the Toast calls which allow us to see output on the console as we go through the development process. Remove keyboard from emulator by hitting the escape key on your keyboard. 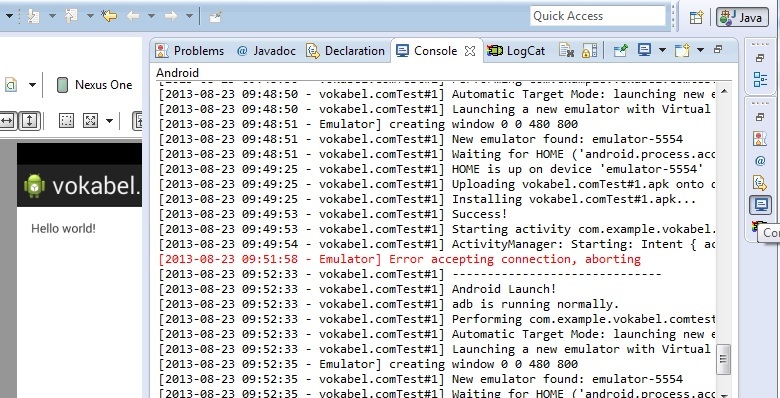 Test your app fully in the simulator before downloading it onto your phone. Now you should be ready to load the application onto your device. First you have to make sure that your device can receive the app. To do this first set your device to USB debugging mode (in my phone it can be done through settings->developer options->USB debugging). Next go to the Eclipse Bundle's .\sdk\platform-tools directory and execute the following command: adb devices . 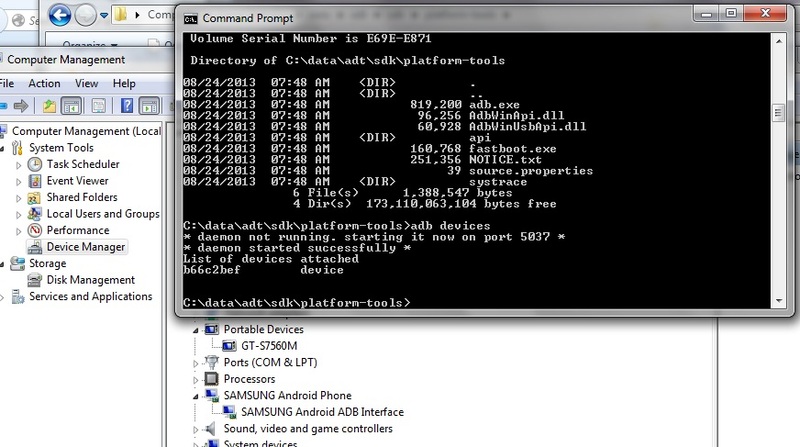 If you see your device you can proceed with the adb install app_name.apk command. 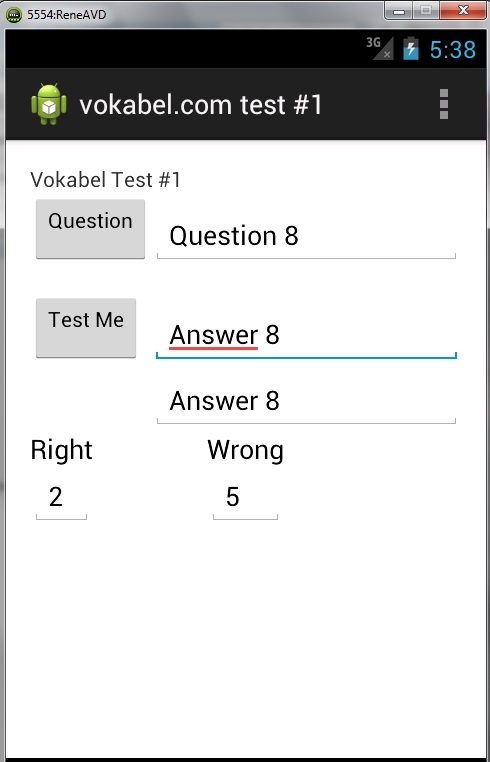 I copied my vokabel.comTest#1.apk file from my workspace\vokabel.comTest#11\bin directory to the .\sdk\platform-tools directory before I did this. You should see the command respond with "success" when the app is installed. Unfortunately, for a lot of phones, you will not see the device detected the first time that you type "adb devices". For the Samsung phones, you will have to download and install the SAMSUNG USB Driver (search the internet for the download). You can tell that it is installed because it is visible in your Windows Device Manager. I've also loaded 100 question/answer pairs into the res\values\questions.xml file for the final English/French word list that will be distributed with the application. The most convenient way to sell your apps to a wide audience and comply with all applicable tax rules is through the Google play store. Assuming that you already have a google account, the process is fairly straight-forward. Make sure that you've tested your app on a smaller phone and a large screen tablet to make sure it is usable on both. If publishing to different devices, you want to make sure that you've changed the layout of the app from "Absolute layout" to "Relative layout" in the xml of the screen files. This will take a fair amount of work. forcing you to go through the intricacies of android screen construction (i.e. not using the GUI builder). Thankfully, there are lots of resources on the web that will answer any questions that you would have. go through all steps in preparing your release. go to the Google Play Developer Console and add you app. Generate the key that you will be using for the app using the java keytool.exe executable (located in the bin sub-directory of the jdk subdirectory. (E.g. keytool -genkey -v -keystore my-release-key.keystore -alias alias_name -keyalg RSA -keysize 2048 -validity 100000). *important* remember your passwords and store them somewhere that you won't forget or you won't be able to update your app. 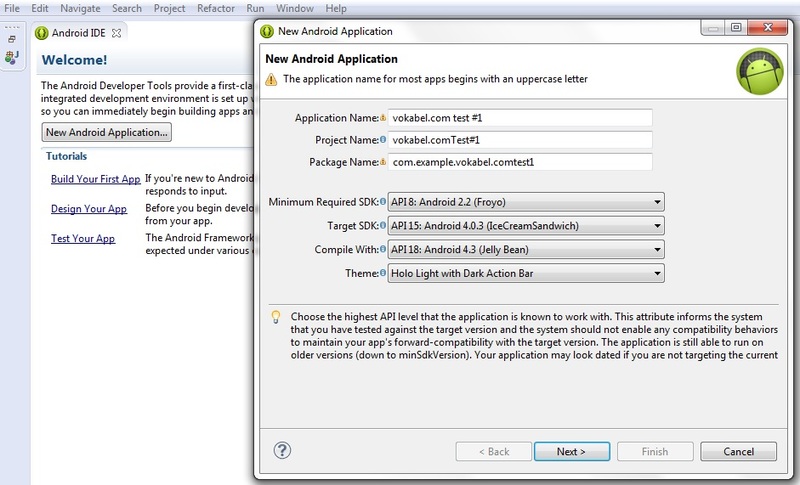 Create the apk file of your production-ready version by selecting File->Export in Eclipse, open the Android folder and select Export Android Application. Click on next and specify the appropriate key that you just created.